Brief: This activity is designed to help students write a high quality formal lab report. 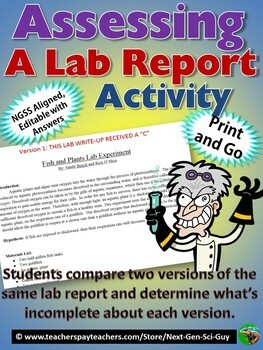 In this activity, students will compare two versions of the same written lab report, and identify insufficiencies in the one version. Students will also list all the ways that the lab could be improved. Answers are included. Prior Knowledge: It is helpful for students to understand how a basic controlled experiment is setup (control group, experimental group, constants, variables). It comes with a walkthrough guide to writing a formal lab report. Everything you need for this lesson is included in the download. Materials and Setup: There is no setup in this activity. Just print and go. If you prefer to make it more challenging, just give students version 1 (the version of the write-up that earned a grade of “C”), and not Version 2 (which got an A). This way, they must find the inadequacies in the lab write-up without having the better one as a reference. As previously stated, the goal of this activity is to give students practice/exposure to proper formal lab write-ups, so that they can write complete labs. It is part of a bundle that I offer, which carries students through the entire process of designing, and writing up an original controlled experiment. not share it or claim it as your own. You may not redistribute it. create products for sharing or selling. you link back to my store.